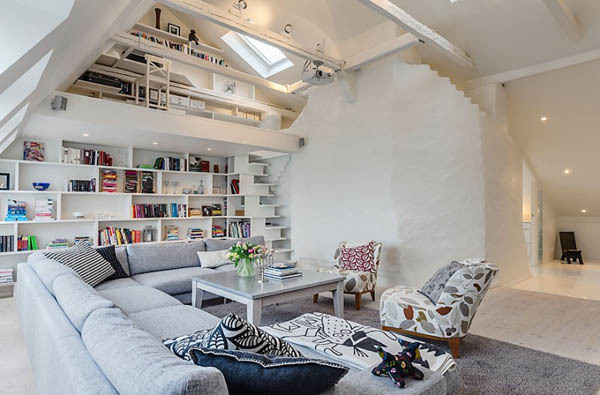 Scandinavian house is about white decorating ideas, spacious and comfortable interior design, simple interior decorating style and pleasant atmosphere. White decorating colors help visually increase the living space and bring more light into home interiors, creating bright and airy room decor with the charm of Swedish style and simple elegance of a Scandinavian house. 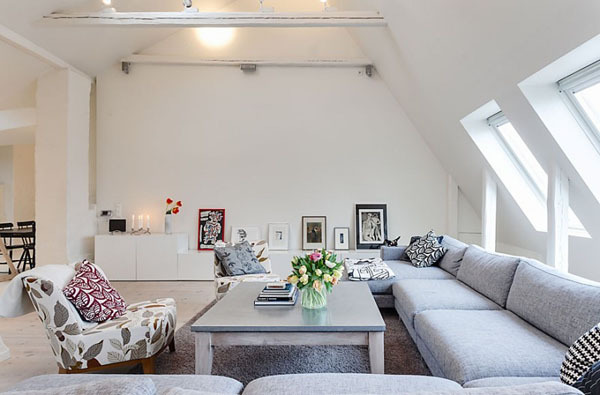 This attic penthouse with a double height ceiling design is located in Vasastan, a central part of Stockholm, Sweden. Renovated in 2007, this gorgeous apartment is on sale at around $1.125 million. 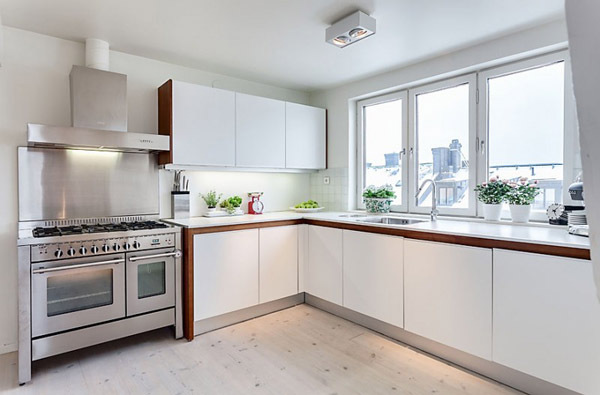 White decorating colors and space saving interior design are functional and modern apartment ideas, that create pleasant and bright home interiors in Swedish style. Stylish room furnishings and colorful accents, leaf patterns and effective lighting design, space saving ideas and artistic decorative accents add charm to this apartment, celebrating traditional Scandinavian house style. Creative blend of old walls and modern wall art works, white painted wooden beams and contemporary room furnishings make old house design look fresh and stylish. Black and white decorating colors add dynamic contrasts to interior design. Colorful decor accessories spice up room decor, creating the atmosphere of traditional Scandinavian homes. Warm decorating fabrics and textiles in white colors, light gray and white paint for walls, floor and ceiling, white furniture and decor accessories are the perfect background for attractive colorful details that emphasize stunningly and bright traditional Scandinavian house design. Simple and graceful, white decorating ideas work well with antique wooden furniture, defining Swedish style that connects generations and enriches old house design, demonstrating its full potential.